Next in the string of restructurings and strategy changes that is shaking the embattled Japanese electronics industry, Sharp today announced that it will partner with Hon Hai Precision, the parent company of the infamous Foxconn assemblyman. This will allow Sharp not only to produce stuff cheaper and speed up the time to market of its gadgets, which include the svelte Sharp Aquos Android phone family, among many others, but also to offload some of its stake in the Sakai LCD plant. 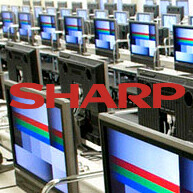 Hon Hai will buy half of Sharp's 93% stake in the plant (the rest is held by Sony). Sharp is the largest Japanese producer of LCDs, but the new iPad screens it supplies are likely coming from its state-of-the-art Kameyama plant. Still, Foxconn got itself half of a well-equipped facility for producing modern LCD displays, so the company might be venturing out of its assembly-only business model.